Between the orbits of Mars and Jupiter is the Main Belt, a region indicative of immense violence. Hundreds of thousands of asteroids occupy this space. Travelling on their orbits around the sun, they often collide causing gigantic impacts that cause immense destruction and reconfigure energy and matter at huge scales. For years, scientists have speculated on the specifics of large-scale asteroid collisions that shaped the planets and the early history of the Solar System. A group of scientists led by David Nesvorný of the Southwest Research Institute brought science closer to the answers about such phenomena with their recent discovery: the age of the Karin cluster located in the Koronis family of asteroids. 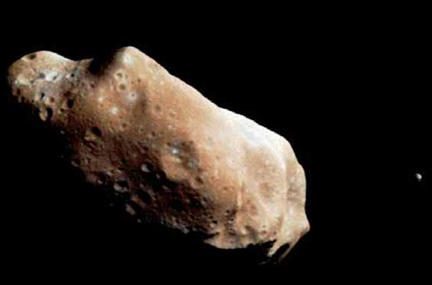 Asteroid Ida and it's moon, Dactyl. Ida is a member of the Koronis family although not in the Karin cluster. Asteroids and their moons are believed to have formed from large scale collision events. Photo by Galileo Project, JPL, NASA. As Derek Richardson, fellow astronomer at the University of Maryland also writing in this week's Nature says, what is especially exciting about the discovery of Nesvorný and his colleagues is that, for the first time, the precise age of an asteroid collisional event has been computed. At 5.8 +/- 0.2 million years old, it is the youngest known asteroid collision. That asteroids collide is a well known fact. However, prior to this discovery studying asteroid collisions was like foraging through a junkyard of old cars to understand the cause of their wreckage. With the new data, the team has a sense of being on the scene of the accident. "What are the physics of these collisions? There is very little information about collisions at this scale as most practical experiments are conducted on a smaller scale. Yet theoretical modeling can simulate the physics of these events and help explain processes of Solar System evolution," Nesvorný says. Until Nesvorný's team discovered this young cluster of asteroids, it was difficult to characterize the properties of original collisions in known asteroid families. Asteroid fragments can be associated with a common parent (grouped as families, or as smaller units within families called clusters) by their similar orbital and spectral elements. Orbital elements are parameters that describe the size, shape and tilt of orbits. Spectral elements consider how an asteroid reflects sunlight at different wavelengths and thus hint at an asteroid's composition. It is widely believed that most known asteroid families are very old and consequently that individual fragments have suffered orbital and spectral changes that obscure the original collision signatures. Dynamic evolution of fragments can occur via subsequent collisions, and gravitational and non-gravitational pertubations. Similarly, spectral elements can be altered by erosion and weathering. "In contrast, younger asteroid families should better preserve the original signatures of a collision," Nesvorný says. Using a cluster detection algorithm that employs data on orbital elements they determined the 39 asteroids in the Karin cluster exhibit remarkable orbital similarities. They then numerically integrated the orbits of the asteroids into the past and determined an age for them. Integration was based on the assumption that, shortly after the break-up of the parent, the fragments would have similar orbital properties. Nesvorný's team discovered that all integrated orbits of the Karin cluster had nearly the same orientations in space about 5.8 million years ago. Because the cluster is young and hence relatively unaltered, questions concerning asteroid surfaces can be answered by examining them with spectral analysis. The spectral elements of these asteroids can be compared to those of meteorites to help solve the debate of whether meteorites and asteroids are related. "So far the spectral elements of asteroids has been found to be different from that of meteorites, but this may be because the asteroids examined are very old and their surfaces have suffered billions of years of compositional change. The Karin cluster has clear-cut young bodies," Nesvorný says. The expected pristine surfaces of the asteroids offer a compelling reason to direct a space mission there Richardson suggests. "It would be the next best thing to being there at the time of collision to now obtain a fresh cut of these surfaces."